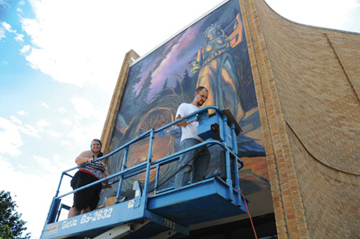 Wendy Chambers (left), a senior art major from Wayne, and Steve Breerwood, assistant professor of fine art, work together to complete the new painting above the outside doors of Davis Hall Amphitheater at USAO. A colorful, rich and mysterious painting – that thoughtfully captures the interdisciplinary USAO mission – greeted students as they arrived back on campus for the first day of classes. Intricate and lush, the new work incorporates symbols drawn from literature, science, philosophy and history. Conceived by Steve Breerwood, assistant professor of fine art, the painting was begun during the independent study period by Breerwood and a small team of students under his supervision. Student painters Wendy Chambers, a senior art major from Wayne, Sarah Hartzell, a senior art major from Amber and Kelsea Mallette, a freshman art major from Spencer, gained invaluable experience. The painting, says Breerwood, explores themes of creativity as a universal force. “I knew it needed to include ideas that crossed disciplines. The two most prominent images are that of a muse and a lamp, suggesting the arts. Above, we can see the Milky Way and below, we have the bower bird which represent the physical and natural sciences,” Breerwood explains. The painting is being completed using fast-drying acrylic paints and is Breerwood’s largest work. Breerwood earned his bachelor of arts from Nicholls State University in Louisiana and his master of fine arts from Florida State University. He has exhibited his art in Louisiana, Oklahoma, Florida, New York, Georgia and Germany. Chambers has been on the project with him from the beginning. There are numerous challenges to working on a painting of this size, Chambers says. Breerwood has not yet named the painting.